“In 2004, a Tutta Bella employee in Columbia City brought food scraps from the restaurant home for her worm bin. This prompted the company to start researching what they could do on a bigger scale to divert restaurant food scraps." Tutta Bella Neapolitan Pizzeria has been committed to waste reduction and energy saving practices since its inception. While sustainability is important to Tutta Bella ownership and employees, their guests provide feedback that they highly value the sustainable practices the restaurant employs. Tutta Bella’s primary focus areas—based on potential business impact—are food waste diversion and using compostable and recyclable materials. Through its composting program, Tutta Bella’s locations region wide was able to keep more than 242,000 pounds of food scraps out of the landfill in 2014 alone. Because food scraps in a landfill create methane, one of the most harmful, ozone-layer depleting gases, recycling food scraps is an important first step for restaurants and households to take to positively impact the environment. Additionally in 2014, Tutta Bella donated surplus food that created over 3,000 meals for local hunger relief through Seattle’s Table, a Food Lifeline program. At Tutta Bella, 100% of its take out packaging and catering service ware are compostable or recyclable. 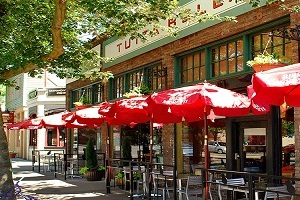 In 2015, Tutta Bella was recognized by the City of Issaquah and as a “Green Achiever.” In addition to using only recyclable or compostable food service containers and service ware and providing compost and recycling collection for customers, the restaurant was recognized for their overall commitment to sustainability and waste reduction. In 2004, a Tutta Bella employee in Columbia City brought food scraps from the restaurant home for her worm bin. This prompted the company to start researching what they could do on a bigger scale to divert restaurant food scraps. They contacted the city to see if they could become part of the city's residential composting program. When the City of Seattle was ready offer commercial food compost collection, the City contacted Tutta Bella and the mayor kicked off the City of Seattle's restaurant food composting program at the Columbia City Tutta Bella location in 2006. Since then, Tutta Bella's recycling, composting and energy saving efforts have steadily increased, resulting in a number of remarkable achievements. Why does sustainability matter to Tutta Bella? Italians have a legacy of embracing traditional ways to grow and harvest food. They use fresh foods and practice curing and aging, naturally reducing any food waste from their processes. They start with the best seasonal ingredients available and then don’t manipulate them much. Meals that originated from peasant cooking now has becoming popular; especially as people are realizing the multiple personal and societal benefits of eating whole, simple foods. Tutta Bella is also committed to energy and water conservation tactics and subscribed to the City of Seattle's Neighborhood Smart Business Program that was managed by Seattle City Light. All Tutta Bella restaurants use energy saving light bulbs, flow restrictors, energy efficient appliances, and green cleaning solvents. Additional water conservation efforts include sweeping outdoor sidewalks, instead of using a hose, and watering all plants with a watering can to avoid water waste. Tutta Bella gives back to the communities it serves in many different ways, supporting schools, organizations and causes that are close to the hearts of its employees, neighbors and guests. The company engages in larger fundraising and community events and has created ongoing partnerships companywide with organizations such as Food Lifeline and Amara. They have a focused community partner program where each Tutta Bella location connects with a local non-profit to get deeply involved (food donations, volunteering, training/mentoring, cross-marketing, etc.) with the organization to help them support their mission. Please check out our location page on our website to find out more.